Download "Somewhere Along The Line"
This is another of Billy's underrated gems from the early 1970s. "Somewhere Along The Line" is much better live than the studio version, which is somewhat tame. In concert, Billy belts it out and his band follows right along with stronger and funkier solos and backing. Lyrically, the song has a nice progression, first dealing with the momentary pleasures of fancy wine and cigarettes, and how they will come back to haunt you later (hangover, cancer) and then proceeding to lust and ambition, and how those vices will also come back to get you, somewhere along the line. It's also a fun and relatively simple song to play on the piano. Go buy the sheet music and check it out. When played alone on the piano (or acoustic guitar), it is reminiscent of a Bob Dylan or James Taylor song. 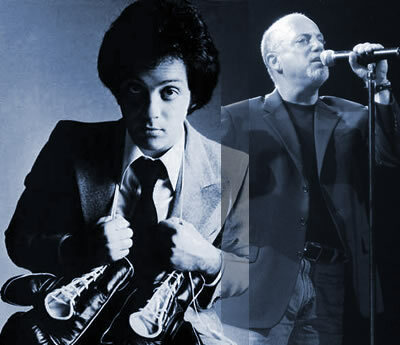 Billy Joel in 1977 and 2006 or so. Photo from www.puremusic.com. This is a live performance from Don Kirshner's Rock Concert (1973). Live version from 1976, Live at the Capitol Theater. Excellent live version of "Somewhere Along The Line" from a 1978 televised concert in Germany. This is a rocking live version (audio only) from Billy's 1977 concert at Nassau Coliseum at the end of the year. The song was always better when performed live. This is apparently a demo version of "Somewhere Along The Line."